The Tenderloin Neighborhood Development Corporation (TNDC) is a non-profit in San Francisco that houses individuals with extremely low-incomes. In May of this year, the organization celebrated its 26th anniversary with grand festivities that included a designer dollhouse silent auction--an auction so silent that I didn't even hear about it (Somewhere my significant other is shouting for joy while clutching the checkbook). Five architecture firms created miniature modern masterpieces that were auctioned off--the proceeds going toward TNDC's positive community efforts. Though I didn't know it at the time, I have already showcased one of these miniature houses designed for the TNDC silent auction: The Modularean Eco House by David Baker + Partners. The featured designer work above is the F3 House donated by Swatt Architects . The TNDC event program gives the following description of the dollhouse: F3 House plays on favorite motifs of Swatt Architects' work. Floating planes fold around fantastic interior spaces that flow to the outside through fully fenestrated walls. The form knits to the landscape as it steps down the sloping site. Furthermore, open planning facilitates an informal family life or entertaining with finesse, where your fabulous dollhouse friends can relax comfortably in custom modular furniture. Fenomenal! 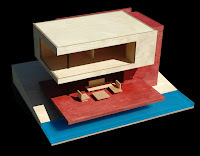 The professionals at Swatt Architects will recreate this 3/8"=1'-0" dollhouse for anyone who is interested. The cost of the structure is estimated to be around $5,000 if they create it in house. However, they are willing to investigate the option of commissioning a cabinet shop to make it for less. Wow! Pricey though. Will they make something that falls in the $200 to $400 range?? It reminds me of something that Brio or Plan Toys could possibly make for the market. Are you listening Brio and Plan Toys? My father made me something similar when I was younger. I'm sure I have pictures of it and will send to you to look at if I can find some. Beautiful dollhouse. However, I am too poor to buy one. More on the same topic: the ridiculousness of their estimates actually drives me to accomplish my long-time dream: I actually build 1/24 models of cars, and I have people and such, but I always wanted to have some 3-D Mid-cen house at the background. Seeing this primitive house built by a "design studio", I'm really empovered to create 1:24 copy of Paul Rudolph's Milan house or Anne Bass residence. The key here is if my daugthers will only hint me that they really want it (instead of helping them jump on the bedroom bed) - I'll do it. And I'll save the plans and time it. Ta-da!